Great Location, Resort Living, 2 Bedrooms, 2 Bathrooms, Swimming Pools, Hot Tubs, Views and BBQ on Lanai! Aloha! This perfectly located top-floor unit comprises of two bedrooms, two bathrooms, sleeps six guests and is sprawled out over 1,209 square feet. Every guest can sit back and relax in this beautiful villa that is comfortably furnished and stocked with all the amenities and is the perfect place to base your Hawaiian adventure. There is a great sense of flow and connectivity throughout the villa making this a great place to entertain. 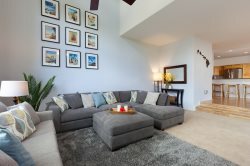 The living room features modern furnishings and a flat screen TV and has slider doors that opens onto a covered dining lanai that offers an outdoor kitchen with a built-in BBQ grill and a dining table with seats for four. Entertaining is easy in the well-equipped kitchen comes fully-stocked with high-end appliances, a breakfast bar with four barstools and a dining table that has seats for six. Rise and shine in the master bedroom suite that features a cozy king-sized bed, flat screen TV and a spacious bathroom that offers a deep-soaking bathtub, a separate walk-in shower and dual sinks. The guest bedroom offers two twin size beds, TV and is near the main bathroom. Extra guests can enjoy the use of the sofa sleeper. Also included is a full-sized washer/dryer, air conditioning and ceiling fans, ice chest, boogie boards, beach chairs, snorkel gear, beach towels, and complementary parking and complimentary WIFI. All vacation rentals include a basic “start-up supply” of: laundry detergent, garbage bags, kitchen sponge, liquid soap, dishwasher tabs, paper towels, toilet paper, shampoo/conditioner, small bar soap and salt/pepper. Cooking oils and spices are not provided. Once the startup supply runs out, guests are on their own to purchase additional supplies if needed. Cleaning solvents are not supplied. You are just a short walk to either of the two swimming pools & two hot tubs, and the area fitness center, and nearby, you will find A-Bay Beach which is a perfect location for all beach activities as well as watching the sunset! Located across the street from the Queens’ Shops and next door to the Kings’ Shops, complete with food court, art galleries, sushi, creamery ice cream, Macaroni Grill, Island Gourmet Market, Starbucks, and many other shops, daily local entertainment, classes and cultural events. Further down the road (10 to 15-minute drive) are other local beaches. We also have a well-thought-out guidebook to the local area, complete with sections describing Waikoloa Beach Resort and all its offerings, important phone numbers, Big Island life information, a guide to beaches, shopping, activities, Luau/Dining, and Golf. We loved every single thing about this condo. Amazing experience! The Resortica Staff is extremely professional and responsive. Thank you to the entire team! We had a spectacular two weeks thanks to Resortica! Besides the staff when the fire alarm went off, we have always had a great experience dealing with staff. They have been prompt, professional, and very pleasant to deal with. MANAGEMENT RESPONSE: I AM SORRY YOU GOT OUR AFTER HOURS EMERGENCY ANSWERING SERVICE THAT DIDN'T HANDLE YOUR INITIAL CALL ACCEPTABLY. I BELIEVE EVERYTHING GOT RESOLVED AFTER THE FIRST ENCOUNTER. We had a great time during our stay at the properties! Weve stayed at the same location twice now and both times have been excellent! Wonderfully decorated and maintained with all the convenience amenities (especially the wifi). We loved the beach villa O32. It was a beautiful property and really well maintained. The property had everything we needed. I would highly recommend it. Wendy is amazing! She was always around to answer questions, either on the phone or via text. She offered ideas for our family to do and was bang on with them! Loved staying there, it was our second time visiting and we plan on returning March 2016! Management Response: Aloha and Mahalo Ms.Boback. We are so happy you enjoyed your time with us. Thank you also for your comments and recommendations, we will be sure to pass them along to the Owner/Management team for consideration. We look forward to you return next year. This is the second time we have utilized the services of Resortica Hawaii - and both experiences have been worry and trouble free. Would definitely recommend! The property was beautiful - we enjoyed having our breakfasts every morning on the lanai. The unit was spacious, and clean, and having the beach items in the garage was a bonus.